I follow the dogs, Harlow, Indiana and Reese on Facebook, and every month I see them share the latest goodies from Barkbox. I was curious to see which pet subscription boxes were available for Canadians. Yes, Barkbox is one of them that ships here. 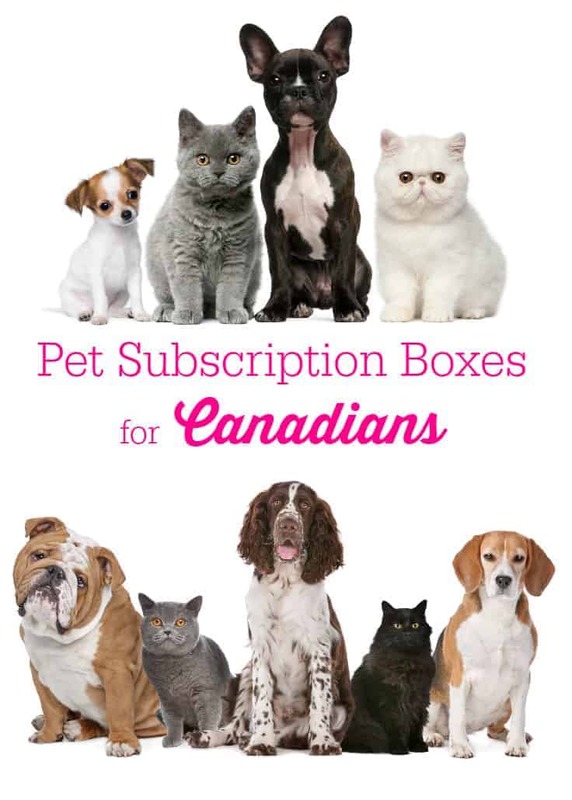 I also found a few Canadian-owned pet subscription boxes too. I think it would be fun for pets to get a monthly surprise shipment of toys and treats. My older cats love treats and my new kitten is still very playful and would enjoy the toys. Pet subscription boxes for Canadians weren’t as easy to find as say beauty subscription boxes or coffee subscription boxes. These companies ship to Canada, with a few being located in Canada as well. All are geared for cats and dogs with BFF Fun Packs also having boxes for birds and smaller pets. I’m mostly interested in the ones for cats! 1. BarkBox ($29 USD/month, $5 shipping). Monthly goodies for your dog. 2. Bowzer Box ($29 CAD/month, $4.50 shipping). Variety of handpicked items including full size toys and treats (wheat free), samples, and coupons. 3. KitNipBox. ($19 to 29 USD/month, $6.95 shipping). Monthly goodies for your cat including high-quality cat toys, all-natural treats, and other fun, healthy cat products. 4. meowbox ($32.95 USD/month, free shipping). Monthly box of cat toys and treats. Use code SIMPLYSTACIE10, you receive 10% off your first order. 5. BFF Fun Packs ($25 USD/month and up, shipping charges extra). Top quality, premium pet foods, treats, supplements, pet essentials, toys for a variety of pets (dogs, cats, birds, pocket pets). Would you ever buy a subscription box for your pet? Express Yourself with #ArtTonite Through Cocktail Inspired Painting in Toronto! most of these are american, only two are canadian, bowzer box and pawpak and i don’t think pay pack is around anymore. These pet subscriptions sound awesome. I will have to talk to my husband about it for my doggies. Thanks! I will have to see if I can budget this in, for my cats!!! As they go through about 10 bags of treats a month!!! My eldest is 17, and my youngest is 7. They are my world!!! I didn’t know there were so many subscriptions for pets…. This has been something I’ve been considering for awhile….I’ve seen this type of booth at dog shows before. I love this idea and my dog would love a box coming for him! I didn’t know these existed. Thanks for the info. My cats would love one of the cat boxes. Wow. I didn’t realize there were so many! I’ve been thinking about trying out meowbox for a while now but I may look into the kitnipbox instead. Thanks for sharing! I have seen the Barkbox and it’s got some great items in it 🙂 Really nice way to pamper your pooch! This is a great idea!! A box of essentials and toys each month, for my pets is something I never thought of!!! It’s a fun idea! I wonder if this happens in Canada?! I love the idea of subscription boxes for pets. How spoiled my little doggie could be!! I get a makeup subscription box monthly and would love to get a box for my cat, too! He’s still just a baby so he goes through a LOT of toys.